If you follow me…even a little…you KNOW I am obsessed with all things 80s! And, much to my Lisa Frank style rainbow unicorn delight, I recently saw that a new SMURFS movie was coming out in a few weeks! 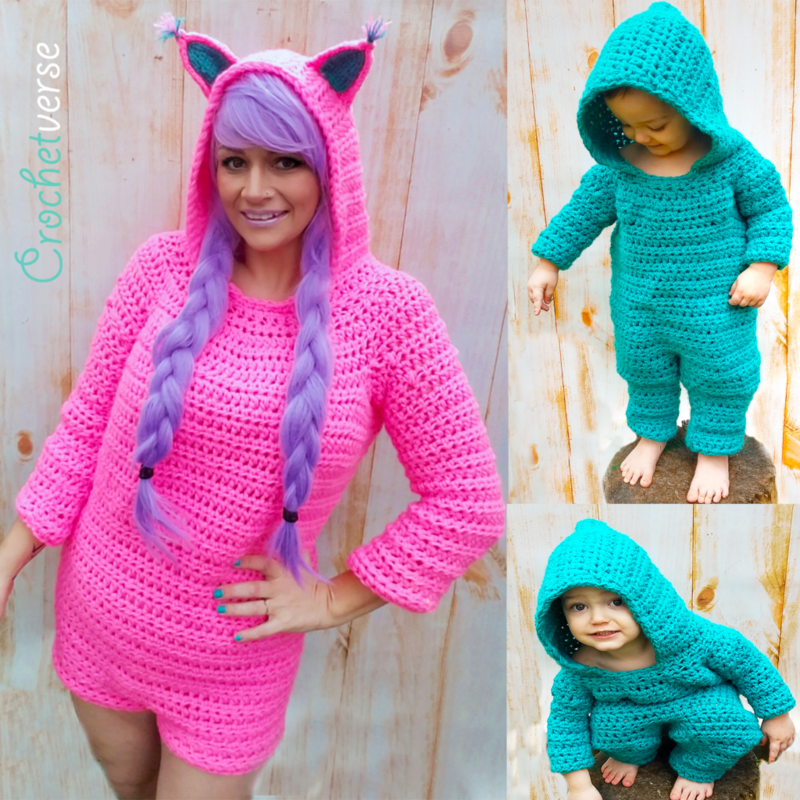 SO, what else to do, but head DIRECTLY for the yarn and make a Papa Smurf Customization for my base pattern, the Blank Canvas Onesie! This tutorial here is a step by step GUIDE to the customization, it will follow though the points to customize the Blank Canvas Onesie into a Papa Smurf! Feel free to adjust as needed to meet your size or visual desires. I feel these guidelines will work with ALL the children and teen sizes, and may need a little adjusting if you want to do adult. My sample here I have created is a 2T/4T so you may gauge! This is an image of the basic onesie, again eleven sizes 0/3 months to men’s XL. It can be any length sleeve or leg you desire. It opens in the back so all embellishments remain clearly visible. 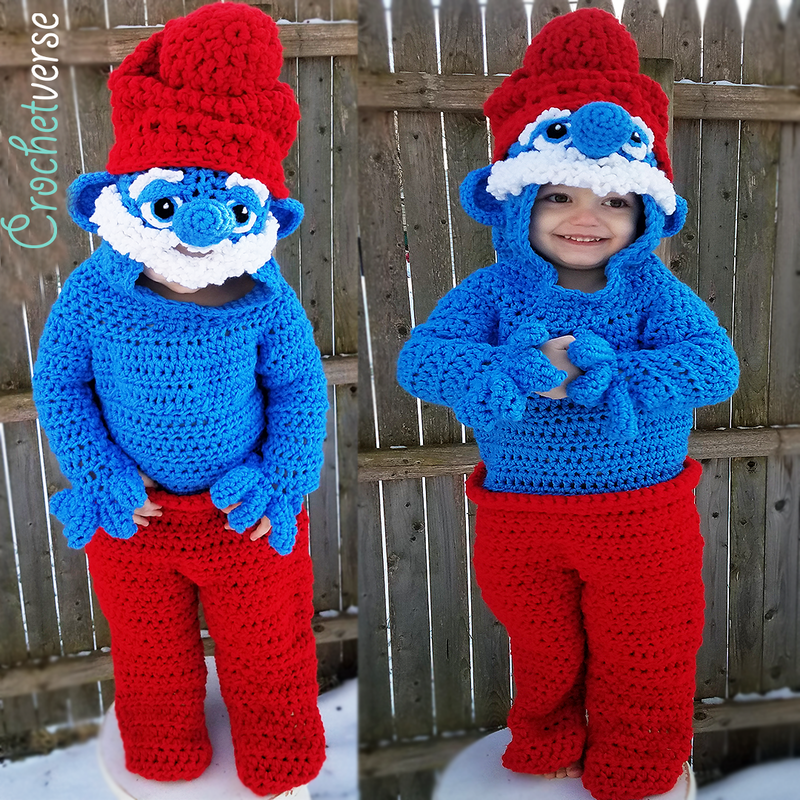 After you get your copy of the basic onesie, follow along below as I detail out the steps I took to make the blank onesie into Papa Smurf! 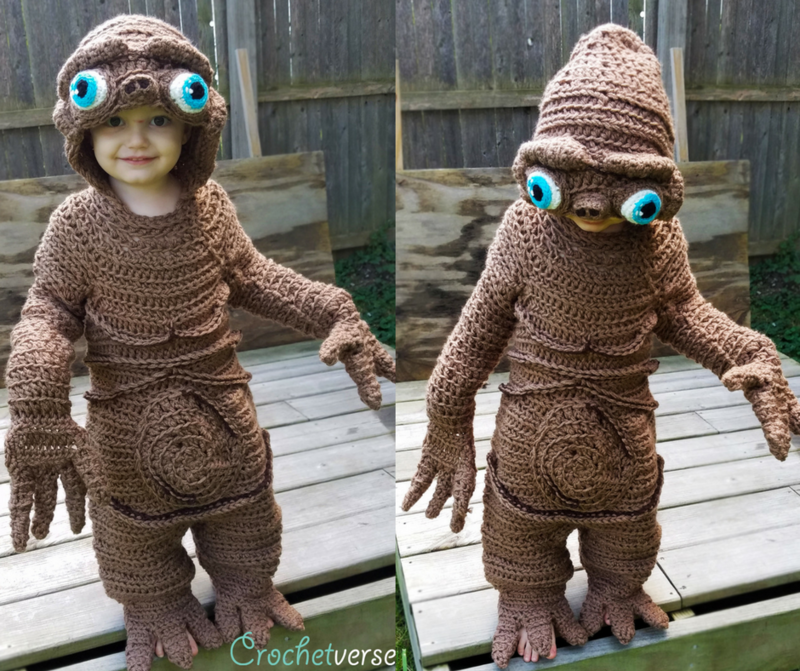 This whole blank canvas onesie pattern was inspired to be created when my ET costume went (to my AMAZEMENT) viral last Halloween! Here he is! 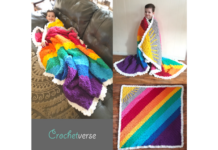 Please always feel free to contact me through one of the social media sites listed at the end of this post, I am here to help you have success with your Crochetverse patterns! I used Red Heart Super Saver Jumbo: (2) Cherry Red, (2) Delft Blue, (1) White and did NOT use all of them by any means. I just prefer to have 2 separate skeins to pull from when I work double strand. Step 2. 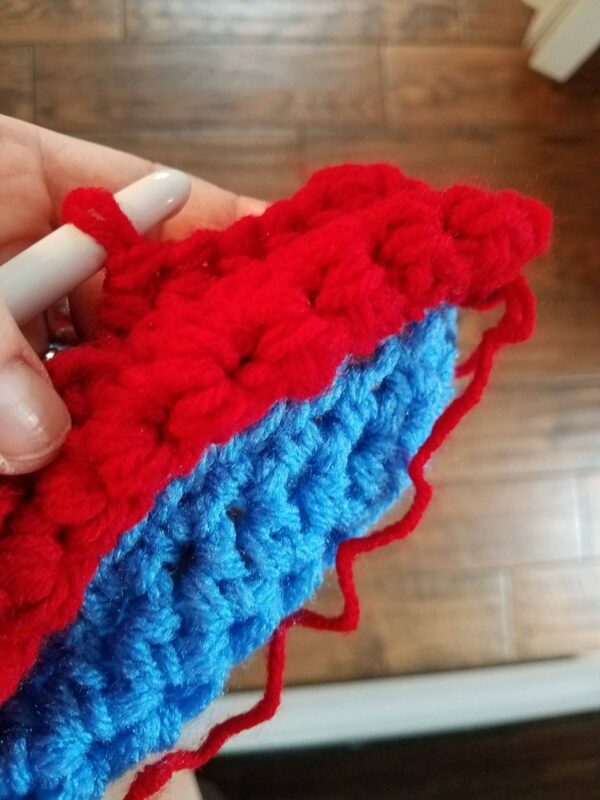 Create “PANTS ROLL”: You want to end the blue on a row with the wrong side of the piece facing you so the 1st row of the red for the pants roll is worked on the right side of the garment facing you. (The pants roll does NOT count as any rows on the garment as far as the pattern is concerned) Four rows of sc should do it for all the sizes. If you want a more prominent pants top roll, work to 6 rows of sc. Row 1: Join red with a sl st to the FRONT LOOP ONLY (The one closer to you) made on the previous row, ch 1, and sc in the same FRONT LOOP ONLY and in each FRONT LOOP ONLY across. Row 2-4: ch 1, turn, sc in same st and in each st across. 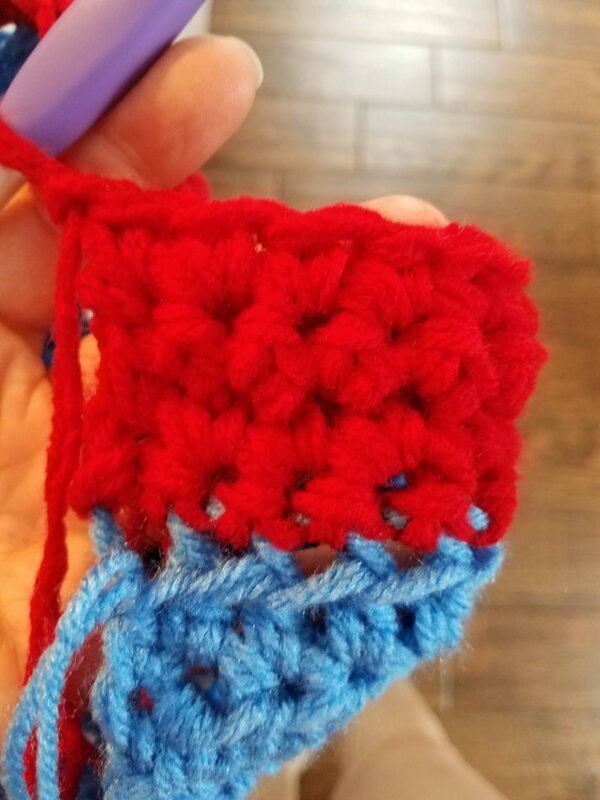 Then for the 1st row that DOES count towards the main pattern rows to finish off the “torso section” as written, we will work it though BOTH loops of the last row of sc AND the REMAINING BACK LOOP of the last row made in blue. This will create a roll/ridge on the front side of the work, simulating the top of the pants. “torso section” on the pattern, worked through the sc AND back loop of the st below. 3. The pants roll ridge created on the right side of the work. Your goal here is to create a tapered extension that narrows to the toe and is long enough to cover the foot of the intended wearer. Adjust as needed. ROUND 8: Once you have created the above extension, you will work around the ENTIRE leg opening in sc for 1-2 rounds for a child and probably 3-4 for an adult. Here is what it looks like unworn. Notice how the foot extension is worked off the front half of the leg opening until it is long enough to cover the foot entirely and tapering though decreasing as you work. Then, to “cup” it into a cover shape, you will sc around the ENTIRE opening of the leg and around the extension working in the sides of the rows as well. Create FINGERS: Chain 5, hdc in 2nd chain from hook and nxt 3 chs, sc in the same st at the base, *sc in the nxt st, chain 6, hdc in 2nd ch from hook and nxt 4 chs, sc in same st at the base. This creates a slightly shorter thumb and three fingers. Edge Round 1: Do not tie off and in the same way you edged the ENTIRE opening of the “shoe” at the bottom of the leg; do the same here. You will sc in each sc, remaining loop of the chains on one side of the finger, and in each st around the finger. Don’t add stitches to round corners, we want the opening to “cup”. Edge Round 2: chain 1 and turn, then sc around the finger and thumb openings only one more time to add a little more depth to them, then tie off. If desired, leave a long tail and then using that tail seam up the rear of the fingers and thumb to “round” them into a tube shape. I did NOT do that on my sample. Repeat it for the other sleeve. On one side you will work the thumb first and on the other side you will work the fingers first. Be sure you place the thumbs opposite as real hands are. Step 6: EDGE THE FACE OPENING AND THE BACK OPENING: Work according to the pattern, then add one more round on the face opening so there is more area to add the facial features onto. For this sample, I chose buttons instead of a zipper. I edged only one side of the opening in 2 more rows of hdc, then a row of sl st. I stitched the buttons to the shorter side, then layed the extra rows over them and just pushed the buttons thought the gaps between stitches in the rows to secure. I am not one for reinventing the wheel if it is not needed. 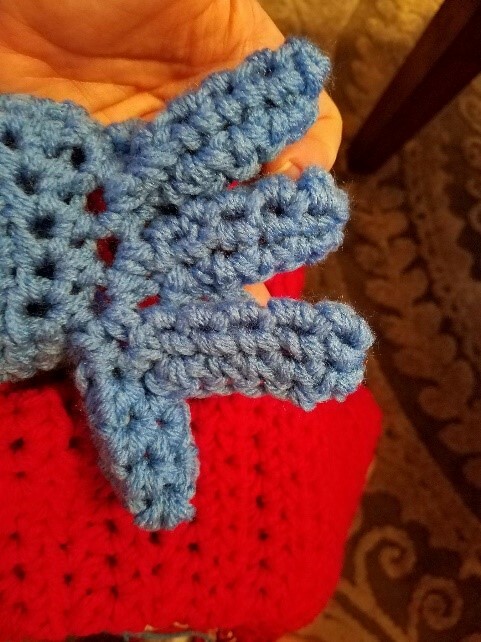 So, when I saw a fellow designer had created a well done Smurf hat in double strand worsted weight yarn, just as I was using; I jumped on the opportunity to support another person’s designs and bought the pattern. 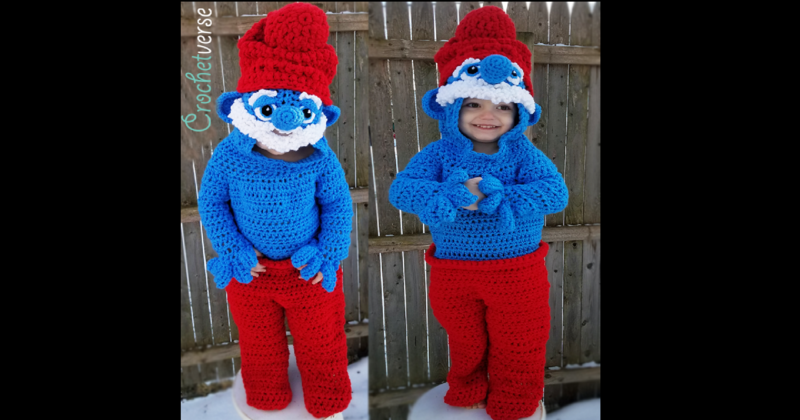 I created it as written for a child with the changes described below and seamed it to the top of the hood as if it was being worn by the Smurf. I worked double strand in red with a N/P hook. I eliminated round 13-16, and then also eliminated round 18. Then finished up as written because I didn’t want the hat to sit too far down on the hood for this project. I left a long tail after the final stitch and used that to seam to the hood. I placed it on my head form for proper placement when I was attaching the hat to the hood and the facial features below in the next step. 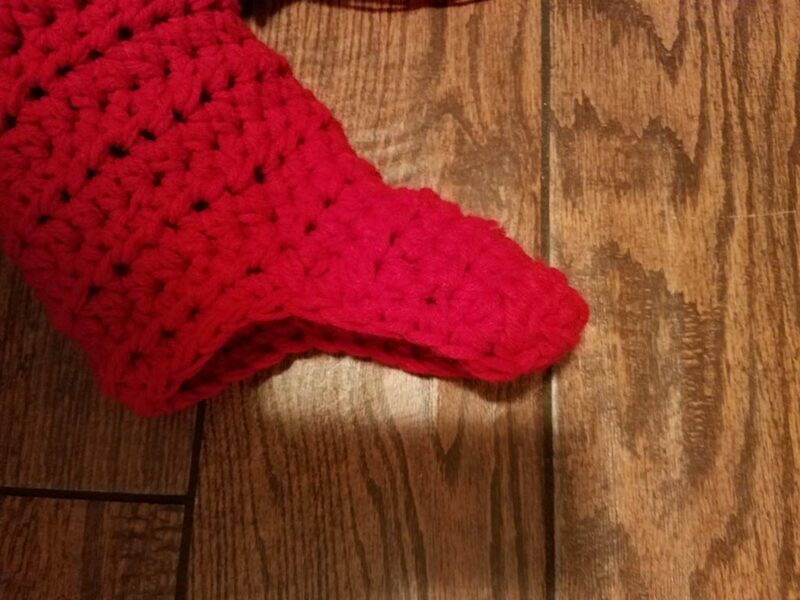 I used the tail to enhance the folds of the hat too. I stuffed the tip with red yarn because the holes were somewhat gapped, I think regular polyfil would have shown too much for my liking. Step 8: Add features ears, eyes, nose. 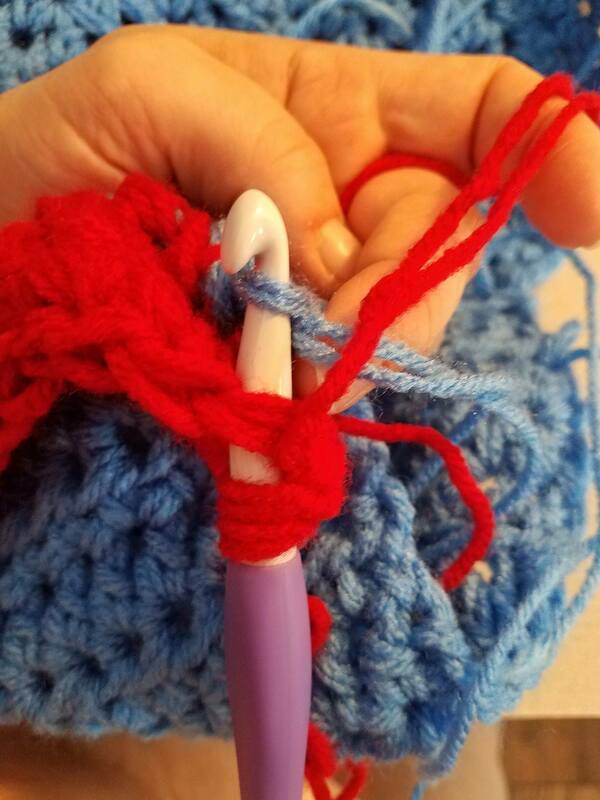 Ears: Double strand blue but drop down to a K(6.5mm) crochet hook for added firmness. Row 1: Make magic circle, ch 1, 6 sc in the ring, pull to close. Row 5-6: ch 1, turn, sc in each sc across, tie off after row 6 leaving a long tail to seam to head. Continue increasing in the same manner if you need a larger ear for an adult size head. With the flat side against the head, seam in a CURVED fashion to either side of the head below the hat using the tails. View the hat from the front, back and top; pin them in place; then seam them on. Rnd 1: Make magic circle, ch 1, 6 sc in ring pull to close. Rnd 4-5: sc in each sc around. Rnd 8-9: sc in each sc around, tie off. Stuff with yarn scraps. Using tail seam to face. Use main photo as a guide. I smushed it so it was slight oval in shape as opposed to perfectly round. Then, I used the tail and went into the hat and about round 6 of the nose to slightly stitch the nose in an upturned position. Eyes: Made in blue, black, and white. Single strand with a G hook. Rnd 1: 6 sc in ring, pull to close, sl st to 1st sc made. Rnd 1: make 6 sc in the ring, pull to close. Rnd 1: make 6 sc in the ring, sl st to 1st sc made, tie off, leave tail to assemble eye later. Assemble each eye: Stitch the black pupil on centered on the blue iris. Stitch that assembly on the rounder side of the main eye base (opposite the hdc,2dc,hdc almond side) and slightly towards the top of the base. Stitch a white eye “sparkle” with just a needle and white yarn. Each sparkle should be at about the 1 o’clock position on the black pupil of the eye. I went in and out 3x for each sparkle. Then, stitch the eye assembly in place on either side of the nose. They turn slightly down towards the cheek and lay about 33% overlapping to the nose. Eyelids: (Make 2) In blue, single strand, G hook. ROUND 4: ch 1, then work a sc in the end of each row up, sc in each remaining loop of the beg chain across the top of row 1, sc in the end of each row down, then tie off leaving tail to seam to face. Seam the eyelid just slightly overlapping the top of the eye on the face with row 3 on the bottom and row 1 on the top. Repeat for other eye. Eyebrows: (Make 2) In white, single strand, and G hook. Row 1: ch 2 more then sl st in 3rd chain from hook, (ch 2, sl st in nxt ch) twice, (ch 3, sl st in nxt ch) three times, (ch 4, sl st in nxt ch) four times, tie off leaving a tail to seam to face. With the chain 4’s to the center, seam each brow over each eye. Beard: With white, single strand, and G hook. Row 2: ch 4, turn, sl st in 1st in the BACK LOOP ONLY of the 1st st, *ch 4, sl st in the BACK LOOP ONLY of the next st, repeat from * across to the end. Row 8: ch 4, turn, sl st in the 1st st, (ch 4, sl st in the nxt st) thirteen times, ch 8, sk the next 8 sts, sl st in the nxt st, ch 4, sl st in the same st, (ch 4, sl st in the nxt st) thirteen times, tie off leaving a long tail to seam to hood later. Row 1: With the loopy side facing, join the yarn with a sl st in ch-4 loop just to the right of the rightmost chain of the ch-8, ch 1, sc in same loop, sc in the nxt 8 chs, sc in the loop directly after the ch-8. Row 2: ch 4, turn, sl st in same sc, *ch 4, sl st in nxt st, repeat from * until the end, tie off. The final step is to seam the beard to the face. Use the main photo as a guide. I seamed it across the VERY TOP of the face opening, only have it hang over a little so you do not obstruct the view of the wearer. The mustache section was seamed directly onto the base and under the nose. Be sure to use caution if this is for a child. Keeping your baby safe is the NUMBER ONE priority! Use all toys, including this costume under constant supervision! If you want to change anything you feel is needed to make you comfortable, please do! PLEASE SHOW ME on my social media linked below or ask questions! 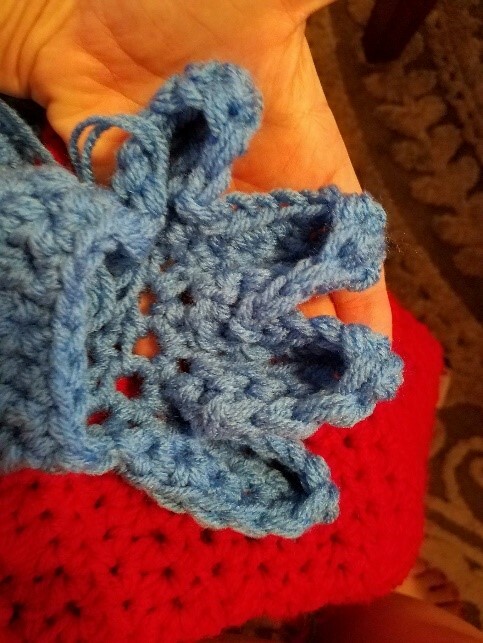 Previous articleFree Bunny Snuggly Pattern – Origami Meets Crochet! Sunshine on a Cloudy Day C2C “Calming Blanket” Free Crochet Afghan Pattern! This is adorable and so is the model!! Thank you!! Think your onesie could be made into Gumby? I know you love all things 80’s. 🙂 Hope to see that pattern one day. Love your work!